One of the perks of becoming a WWE Champion is that you get to be part of a photo shoot with your new title. For The New Day, this is familiar territory because it's the fourth time holding a top tag team prize in WWE. So this time, they decided to change it up a little bit. Shawn Michaels was extremely popular in his day. He is still a fan favorite, but during his prime, he was a huge heartthrob as well as a WWF Superstar. Michaels was part of a very famous photo shoot for Playgirl magazine in 1996. We're not going to post the pictures here because this is a family-friendly website. But in one of the shots, Shawn appears to be unclothed while laying down with the Winged Eagle Title placed strategically before him. When The New Day won the SmackDown Tag Team Championships it meant they were one step closer to securing the record for most title reigns. The goal is eight so they're creeping closer being half-way there. During the photo shoot, the new SmackDown Live Tag Team Champions decided to pay homage to Shawn Michael's infamous Playgirl photo shoot. It's good to see New Day are having fun with those titles because odds are they'll get pretty familiar with them by the time it's all said and done. Xavier Woods is currently out of action with a minor knee injury but he'll be back soon. There were recent reports from fans in attendance at the Honolulu Hawaii Live Event saying Kofi Kingston hurt himself in some fashion as well. Hopefully, they'll all get to 100% soon enough so The New Day can keep entertaining fans for a long time to some. 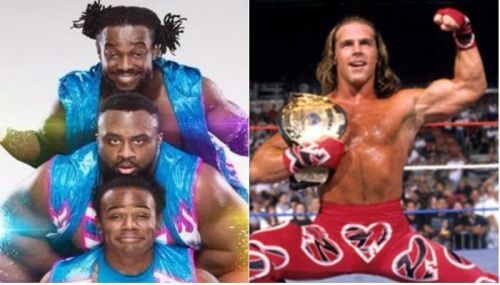 There really are no words to describe this photo of The New Day. I'm just glad that unlike Shawn Michaels, they were wearing their ring gear. WWE Exclusive: The New Day says all three of them could be Champions at WrestleMania & more!